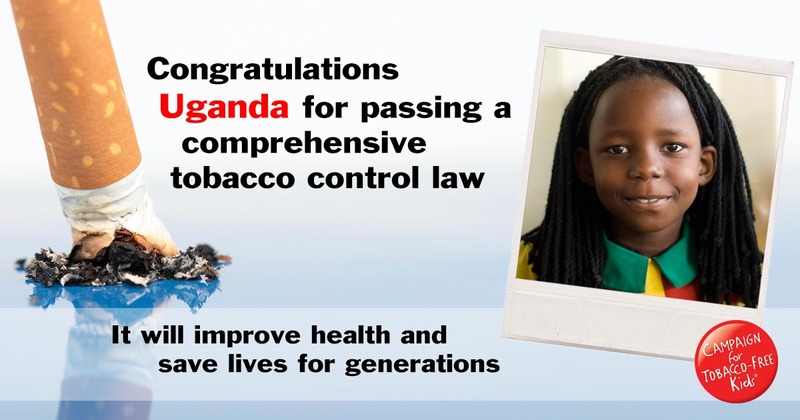 Uganda has joined the growing movement to reduce tobacco use in Africa by enacting a comprehensive tobacco control law. A key provision of the law requires 100 percent smoke-free indoor public places, workplaces and public transport and also prohibits smoking within 50 meters of all public places. This provision and others faced strong opposition from British American Tobacco Uganda, which lobbied policymakers to provide for designated smoking areas. According to Uganda’s first-ever Global Adult Tobacco Survey released in July 2014, 62 percent of adults who visited bars or nightclubs reported exposure to secondhand smoke, while 20 percent who worked indoors reported exposure at their place of work. The new law will protect everyone’s right to breathe clean air. Requires graphic health warnings covering 65 percent of tobacco packages. Bans all tobacco advertising, promotions and sponsorships. Prohibits the sale of tobacco products to anyone under 21 years of age. Prohibits cigarette sales within 50 meters of educational institutions, health facilities, cinemas, police stations, prisons and other places where children are cared for. With passage of the new law, the government of Uganda has sent a strong message that public health should and will prevail over tobacco industry profits and intimidation. It is now critical that the government effectively implement and enforce the law. Uganda’s law sets a powerful example for Africa, which has traditionally lower rates of tobacco use and has been targeted by the tobacco industry as a major growth market.